Its just me tonight. Hubby is off at a ‘board meeting’ and little girl is out with a funny tummy. I’m cooking for myself. I popped a frozen Kirkland pizza in the oven, and while it’s quite good for a frozen pizza, it wasn’t quite going to do it for me. Simultaneously, I was trying to go over my remaining produce from the Kula Fields delivery and see what I could make. Pineapple, bananas, tomatoes- gone. Some basil, arugula, and lettuce remain, plus an onion, but those things usually last for a while, plus I use onions all the time so I wasn’t particularly worried about that fragrant little guy. But the arugula sparked something in my head, and it quickly joined with some leftover goat cheese on the top of the pizza. 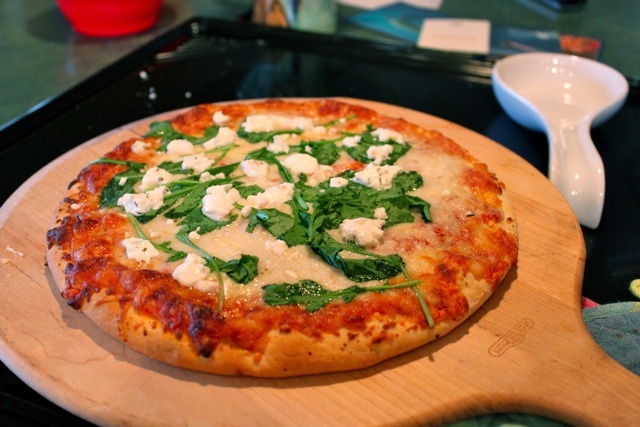 I cooked the pizza for almost the recommended time, then took it out and arranged some arugula and goat cheese on top, then popped it back in the oven for a couple minutes, for it to just melt on the top a bit. It was really heaven in my mouth, and honestly, you could serve this at a dinner party and no one would ever be the wiser. This entry was posted in Food and tagged arugula, frozen, goat cheese, Kirkland, Kula Fields, pizza. Bookmark the permalink. I love Arugula. I grow heaps of it in the back yard… easy to grow, btw….. re seeds itself happily….. It is sooooooo good, obviously the bacon takes it over the edge, but even without, the combo of a rich fat (butter) tempering the bitter/spicy greens, is such a delight. I feel on top of the world with this breakfast. I prefer the sourdough loaves at Mana Foods or Whole Foods, we go through at least a couple a week…..
WE have picked up a few pre-made pizzas and do the same – top on all sorts of yummy extras. A little extra veggies always goes a long way! Love the response too – will have to try growing my own arugula this summer! I am hooked! It’s absolutely amazing what we can do with the tidbits of foods in our homes! I like to add garlic, spinach, avocado, and oinions on almost everything! lol The pizza looks yummy 🙂 ~Pernisha G.